Have you noticed CodecV on your system? You should know that this program is an advertising-supported application and it is going to display you a variety of advertisements, especially when you browse online shopping websites. You will not be able to dismiss all these commercials whenever you want; it means that you will be forced to notice them every time you surf the web. As you have probably understood, all these ads will definitely interfere with your browsing activities. What is more, they might even cause harm to the security of your system. If you do not want to risk infecting your computer, you should erase CodecV without any further considerations. Are you sure that you have not downloaded CodecV itself? If it is so, it is a huge possibility that it came together with additional programs. It is known that this application might come bundled with other adware programs or other unwanted applications. You should always select custom installation and then follow the wizard carefully. If you keep this advice in mind, you will be able to prevent those programs that come in a bundle from appearing on your system. Have you already noticed unfamiliar applications? We recommend that you erase them from your system as they might cause harm to your security as well as slow down your computer. Furthermore, CodecV is eager to collect some information in order to provide you with more personalized content, for instance, advertisements. Thus, it tends to collect such data as your search queries, your browsing history, and other information such as your IP address, your location, your internet service provider, and the like. If you do not want to share this information with anyone, you should remove CodecV. You should also remove CodecV in order to stop all these annoying ads which might not also bother you at the most inappropriate time, but also lead you to malicious software. You should definitely not pay attention to all these ads and definitely not click on them. The best what you can do is to erase CodecV itself and all the advertisements will disappear together with it. If you want to erase this advertising-supported program from your system, you should know that it might have attracted other threats onto your computer, which is why you need to scan your system with an antimalware tool after the manual removal of CodecV. Of course, you can also acquire a full-version of the antimalware tool and scan your computer with it. It will erase all the existing threats and keep your computer protected all the time. We recommend using SpyHunter. Find the unwelcome program and select it. Click the Start menu button to open the menu. Select Control Panel from it. Access the Metro UI menu by pressing Windows key. Move your cursor to the lower-right edge. Select Search when the Charm bar appears. Type in “Control Panel” into the search field and then select it. Locate CodecV on the list. Right-click on it and then select Uninstall. Launch your browser and then press Alt+T. Select the extension that you want to delete. 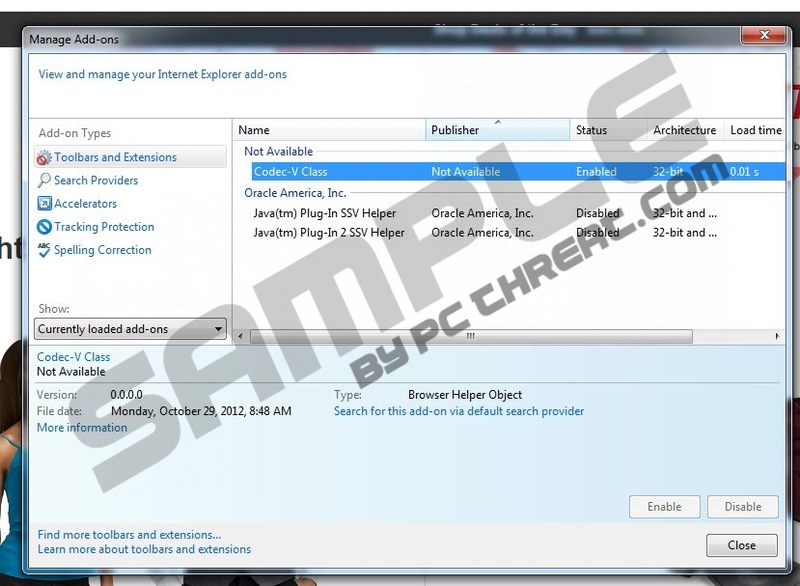 Find the unwanted extension and click Remove. Select Tools and then access Extensions. Select the needless extension and click the trash button. Quick & tested solution for CodecV removal.